Audio advertising is booming thanks to music streaming services. 84% of advertisers say digital audio will play a bigger role in media plans in 2018. 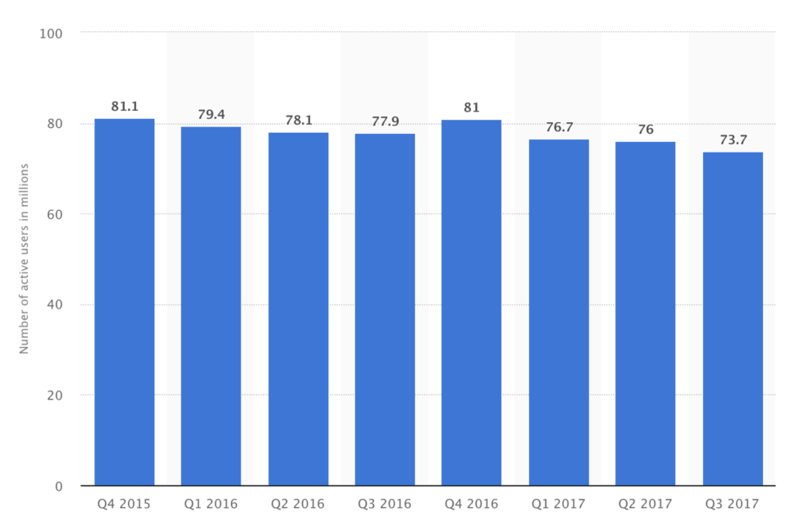 Last year, audio ad revenue spiked from $425 million to $603 million, representing a 42% increase in one year! Audio ads are appealing to advertisers. After Prince went live on Pandora, 686,348 people added a Prince station on Pandora in just one day. After the Bruno Mars’ Grammy performance of “Finesse” with Cardi B, his song was streamed 2.3 million times. And companies like Spotify are already taking advantage of this growing trend. They spearheaded the launch of programmatic digital platforms in 2016. They have since been leading the way in offering display ads to marketers through real-time bidding (RTB) solutions. New kid on the (advertising) block, Pandora needed to come up with an easier option to appeal to advertisers. Pandora recently announced they are ready to compete for real-time bidding of audio ads with Spotify. Let’s look at the features of both Spotify and Pandora’s real-time audio ad bidding. Spotify released their beta ad platform, Spotify Ad Studio, in 2016, becoming the first streaming service to allow users to bid on audio ads in near-real time. This meant that users could create programmatic ads using Spotify’s music library without paying exorbitant single-use or license fees. They could instead purchase music using a real-time bidding (RTB) auction. The launch of the Ad Studio paid off, and in 2017, RTB audio ads made up 18% of Spotify’s ad-supported revenue. And, it works for brands too. 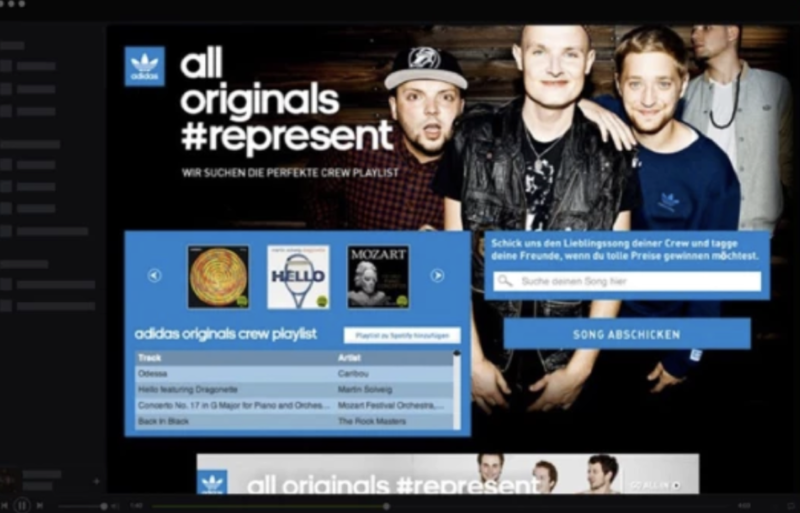 Adidas Originals used multiple ad formats on Spotify to drive awareness for their new All Originals campaign. In the end, Adidas Originals saw 30,000 ad page visits using Spotify Ads. Spotify was until recently the only player in the music industry getting involved in RTB auctions. Pandora announced this year they would be offering their own audio inventory programmatically. Although they already offered their inventory of programmatic advertising with display and video, they have not provided audio until now. John Trimble, Pandora’s Chief Revenue Officer, explains, “It’s clear the future of advertising is digital audio. The key to unlocking that investment is programmatic audio.” Pandora has already seen success. They partnered with Lane Bryant to help grow revenue streams. Lane Bryant increased store traffic by 17% over the holiday period compared to their original 7% goal. While Spotify still outranks Pandora when it comes to interest as an ad platform, marketers may begin to use their budgets toward buying audio ads on Pandora to reach new audiences. The RTB ad-buying process involves the demand-side platform (DSP), the ad exchange, and the supply-side platform (SSP). Demand-side platform (DSP) automates the purchase of ads on behalf of advertisers. Ad Exchange is an open marketplace where advertisers can evaluate, bid on and buy inventory from the publishers in real time. Supply-side platform (SSP) is a platform that helps publishers sell their inventory. Publishers don’t have to use an SSP if they also have internal inventory they can sell on their own. With RTB ads, advertisers use the DSP to choose how much to bid, inventory type (pulled from the Ad Exchange or SSPs), and ad space. The real-time auctioning happens on the ad exchange. The advertisers will place their bids on DSP, and the winner gets the ad space. Winning ads are then displayed on the publisher’s platform. Spotify and Pandora have deals with multiple marketplaces to create a much larger inventory. Spotify has partnered with Rubicon Project, The Trade Desk, and AppNexus. 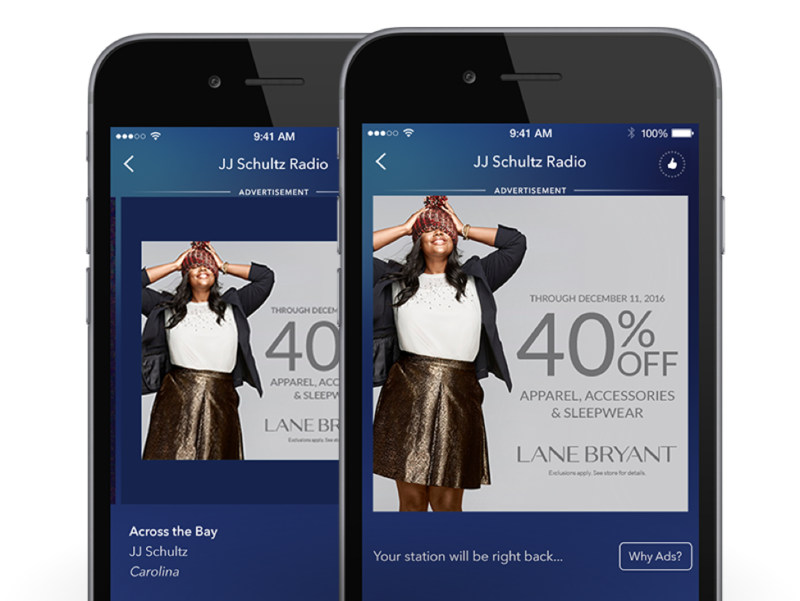 Pandora has partnered with The Trade Desk, AdsWizz’s AudioMatic and MediaMath. Larger inventories encourage more ad investment. As other music streaming services begin to offer more digital advertising options, it will be important for advertisers to choose the right channel when running ads. While both Spotify and Pandora allow advertisers to create unique, targeted audio ads, there are some key differences that might sway markets to take advantage of one platform over the other. Spotify has previously boasted 159 million active monthly users around the world. By the end of Q1 2018, the company announced it had 170 million monthly active users. Meanwhile, Pandora’s latest report showed it only has 73.7 million active users monthly. 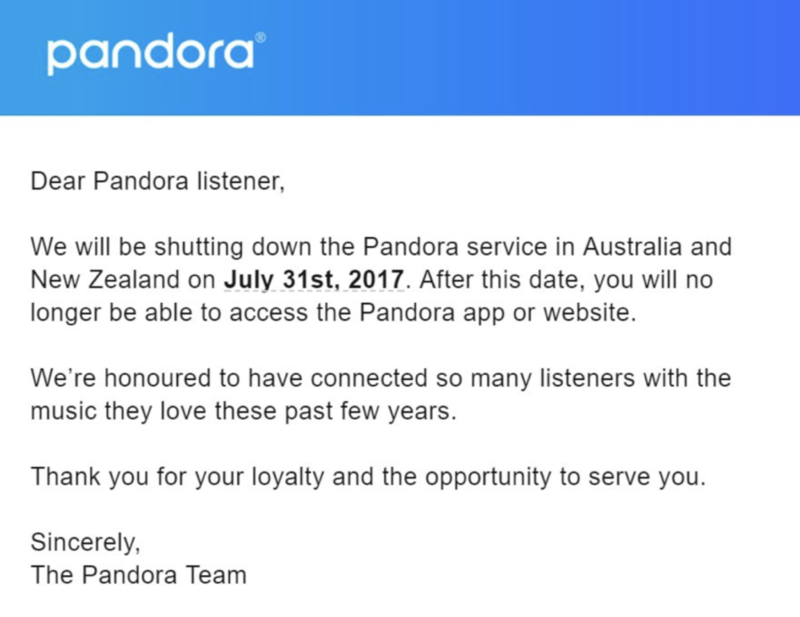 And, Pandora is currently only available in the U.S. after dropping its services from Australia and New Zealand last year. If it’s important that ads reach a global audience, Spotify is the reach winner (for now). Your ad reach is only as good your audience targeting. Spotify has 75 million premium subscribers. Pandora has 5.63 million premium subscribers. Paid subscribers of both platforms won’t hear your audio ads. As an advertiser, that’s something you need to consider when choosing between the two platforms. 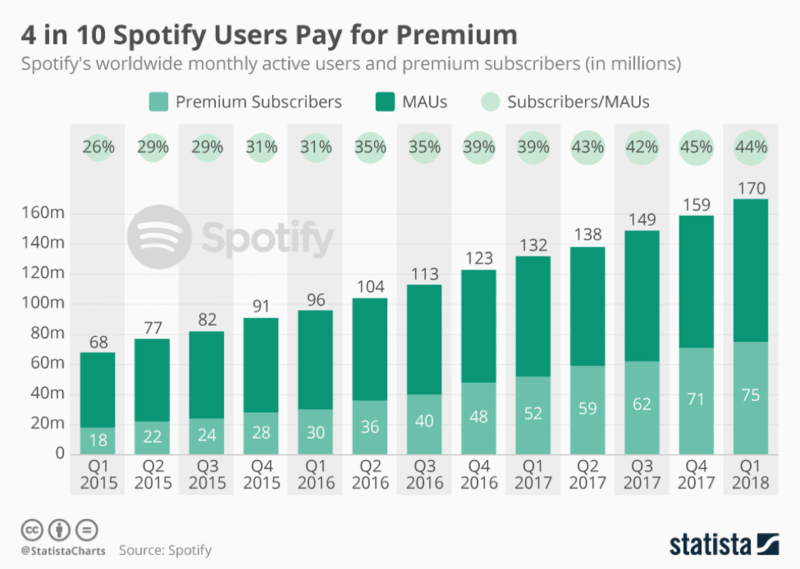 For now, Spotify still boasts more free users, which means they have a bigger addressable audience compared to Pandora. However in the future, having less Premium subscribers may be a reason advertisers turn to Pandora. 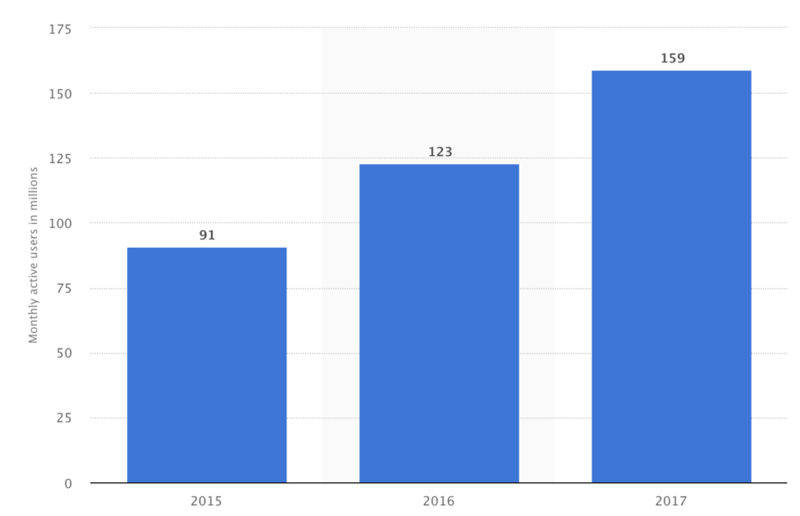 In terms of projected growth, you also want to choose an ad platform based on how well it’s growing over time. The greater the growth projections, the bigger the budgets and the better the inventory. 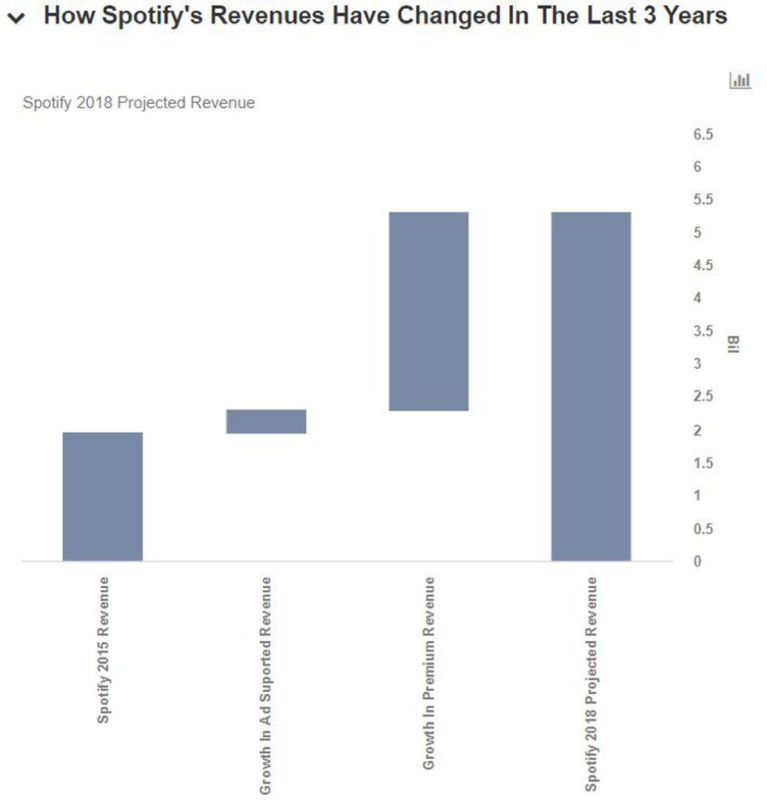 Spotify was growing at a faster rate than Pandora. 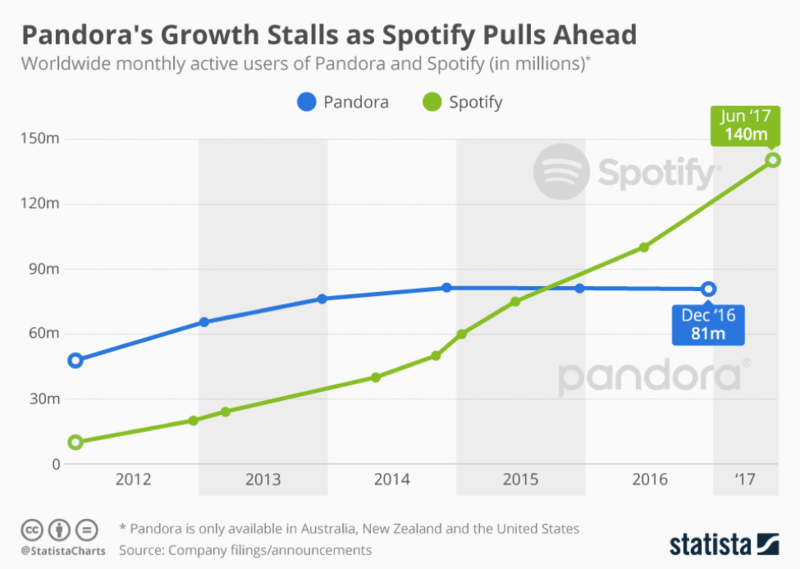 However, Pandora’s recent growth and Spotify’s recent fall could open up more opportunities for advertisers who want to stay on Pandora’s platform. According to their Q1 2018 report, Pandora generated $319.2 million in revenue during the first three months of this year, compared to $316 million during the same quarter last year. SiriusXM recently invested $480 million into Pandora’s stock, giving them a 19% stake in the company. These are all green lights for any forward thinking display marketers wondering if they should start advertising with Pandora. It should be noted that SiriusXM also works with Liberty Media, which has a stake in iHeartMedia (which also has their own programmatic ad platform). While there’s no guarantee of a merger, it’s possible that Pandora and other streaming platforms like iHeartMedia will eventually combine forces for a better ad platform against Spotify. The cost of advertising on either Spotify or Pandora varies depending on the type of advertising you choose. Both are based on Cost Per Thousand (CPM), so you will be charged for every thousand listens (ad impressions). For audio ads, Spotify’s CPM is around $5-$30, while Pandora’s is roughly $8-$12. Spotify has a minimum of $25,000 per campaign, which might keep cash-strapped small businesses at bay. However, brands can still run individual ads through the Ad Studio with a minimum budget of $250. Pandora’s basic campaign packages start at about $1,500 per month with no minimum, which may make it a more appealing platform for small businesses. Ease of use is another consideration for advertisers. 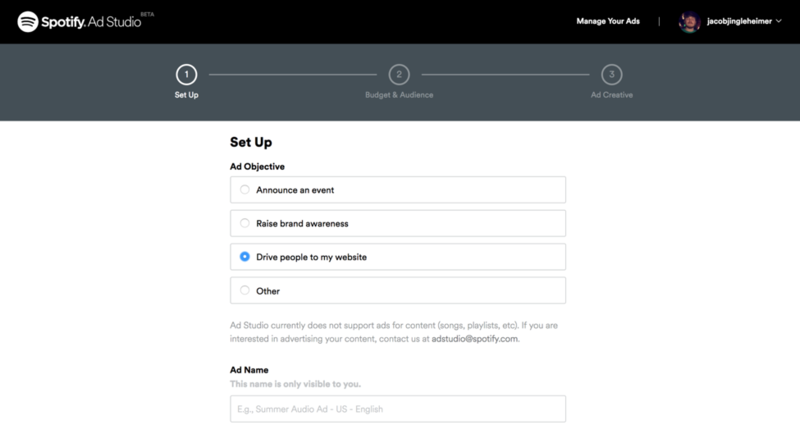 Currently, you can create ads on Spotify through their self-serve platform, Ad Studio. Or you can purchase ads directly through Spotify for Brands or through a trade desk partner like Acquisio. 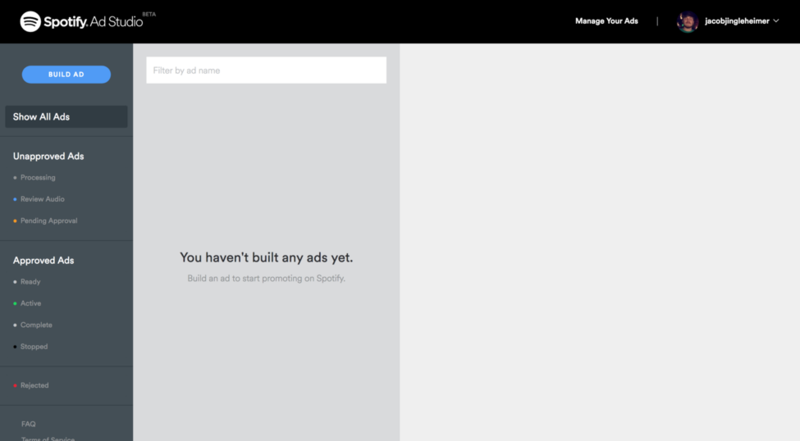 Because Spotify’s Ad Studio platform is still in beta, there is a waitlist for becoming an advertiser. So, first, you must sign up to join their waitlist. Once you’ve been accepted, you can create an account. After you’ve created your account, click Your Ads in the top right-hand corner, then click on Build Ad. You’ll be directed to the Set Up page. This is where you’ll choose your ad objective and ad name. 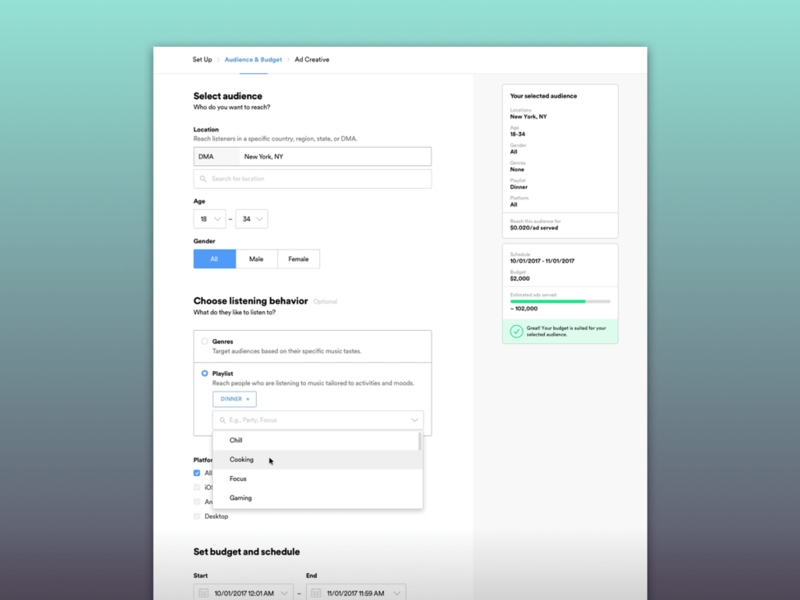 Next, you will be able to fill out the Budget & Audience section. 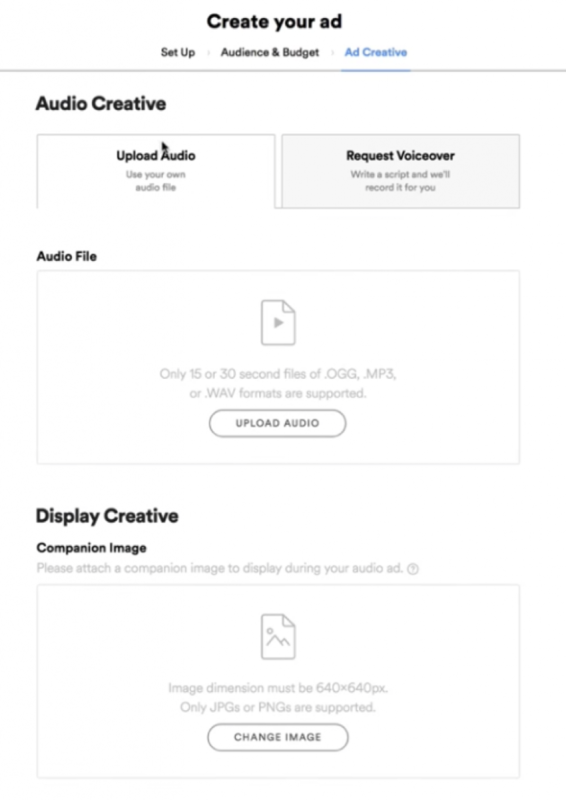 Finally, upload your audio script to the platform. 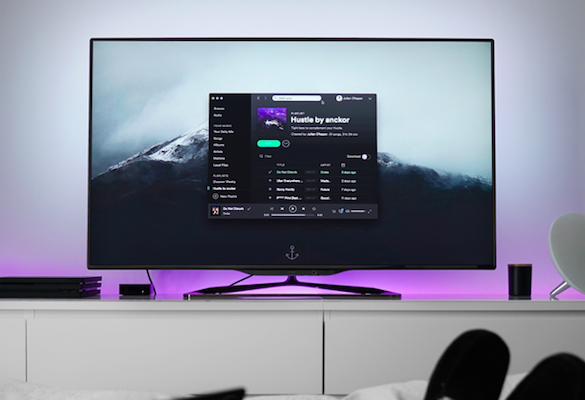 Ads appear on all Spotify-enabled devices including mobile, tablet, desktop, and on connected TVs, car and home devices. You can find RTB audio ad options with Pandora for Brands. Currently, you must register as an advertiser with Pandora to buy ads or you can buy ads through a third-party service connected to Pandora, like Acquisio Trading Desk (ATD). However, Pandora has partnered with the Ad Council known as A Million Ads to test out the potential of a new self-serve platform. And, they bought AdsWizz which will allow advertisers to buy audio ads across a variety of publishers, including Spotify on Pandora’s self-service platform. It’s too early to tell if Pandora will launch their own ad platform outside of A Million Ads, but for the time being, they’re still in the RTB market. Real-time bidding on audio ads are scalable and efficient for many brands, but brands need to understand how to optimize ads to get the most ROI. Spotify claims their ads were 25% more effective at driving incremental sales per 1,000 impressions than NCS benchmarks. But, how do you achieve this type of success with RTB audio ads? Contextual audio ads are the best strategy. 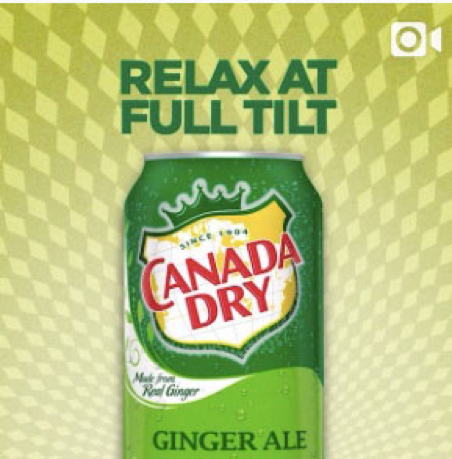 Canada Dry used Spotify’s “chill” playlists to target listeners mid to late afternoon. The campaign was meant to connect with their audience when and how they are consuming their products. “We really backed away from looking at pure consumption targets and audience to go more after mindset, not going too narrow with our targeting,” Brit Sundberg the programmatic media and data strategy manager for Dr. Pepper Snapple Group (who owns Canada Dry) told Ad Exchanger. Canada Dry automated audio programmatically to leverage contextual audiences. Their placements were 95% in view across the board. And, audibility and viewability on completion was about 87.5%. 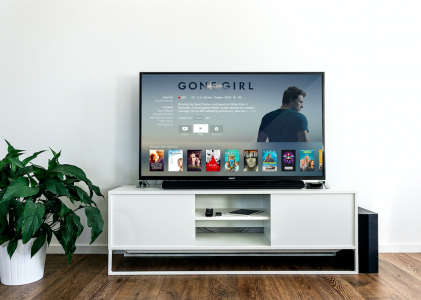 By targeting users on connected devices with Pandora’s targeting options, Nestlé Waters can provide more relevant and contextual audio ads to cross-device users. 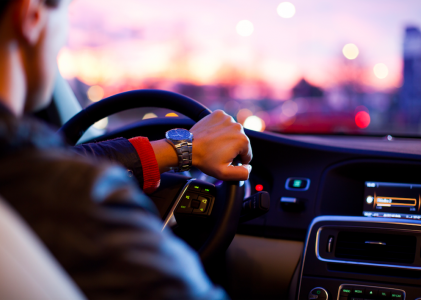 Pandora and Nielsen produced a contextual relevance study together. They saw that contextual ads that paired with personalized radio stations saw more than 33% for purchase intent when compared to TV ads. This increase proves the idea that targeting consumers in the right environment is just as important as the content. For example, the study found that eating food while listening to relevant audio ads created an increase in affinity and purchase intent. In addition to creating contextually driven audio ads, advertisers should aim to create shorter ones as they tend to perform better. Pandora found that audio ads around 8 seconds in length performed better with younger audiences. While audio ads 10-30 seconds long were successful in driving conversions for a broad age range. Lizzie Widhelm, SVP of Ad Product Strategy at Pandora, says that a mix of 10- and 30-second audio ads were the way to go. 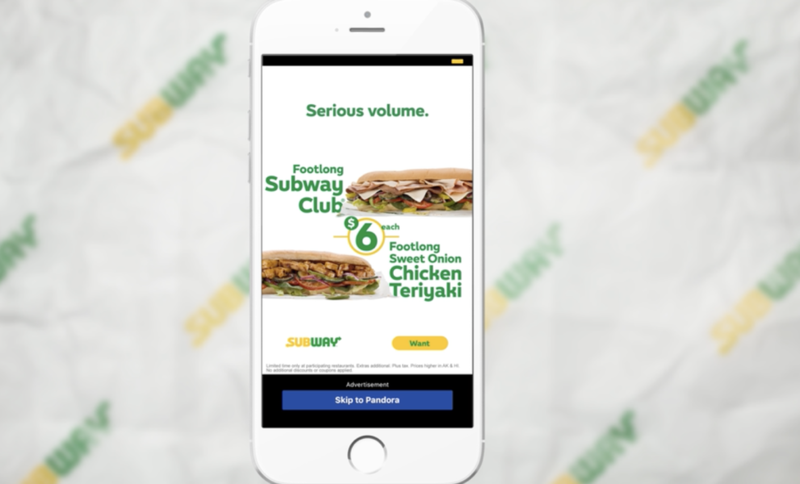 They tested this with Subway’s new Footlong campaign by creating a 13 second ad. At the end of the day, advertisers should choose a platform that covers their shortcomings. If you’re on a budget and struggle with personalized ads, Pandora may help you increase personalization and improve ad performance. If you want a self-serve option that gives you more creative control, Spotify’s pioneering efforts with Ad Studio may be the better choice. Ultimately, both platforms are trying to increase ad revenue and help you display your ads, and both will use the technology they have to keep you happy. The beauty of RTB audio ads is in its flexibility for the advertiser. The ability to access quality music and create highly targeted, personalized audio ads without having to pay high costs is appealing to many marketers. 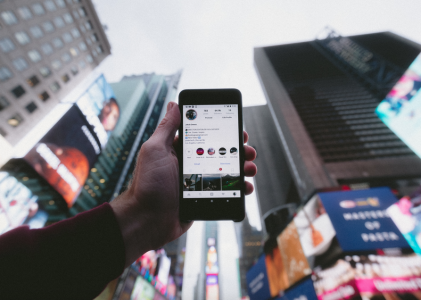 Now that platforms like Spotify and Pandora are offering RTB advertising, marketers have more opportunities to create ads that will reach their audiences in more places. When it comes to actually choosing a platform, keep goals and other limitations in mind. Spotify has a great global reach, a larger accessible audience, but when creating larger campaigns, they’re more expensive. While Pandora is trailing only a little behind Spotify, they still offer highly personalized ads at a more affordable rate, which might appeal to smaller businesses looking for an ad boost. Just like Spotify, Pandora has recently expanded into RTB and offers inventory that can be accessed with partnered DSPs. Should you not meet the budgetary threshold to go directly to these platforms, there’s always the possibility to access this inventory with a managed service Trading Desk, such as ATD. Experienced campaign managers are there to help place these buys with accommodating minimums. No matter which option you choose, one thing’s clear: audio ads are here to stay! Tiffany McNeil is a Senior Campaign Manager and Sales Specialist for Acquisio's Trading Desk (ATD). She's been with the company more than 5 years now, previously holding positions as a Display Campaign Manager and Display Coordinator.